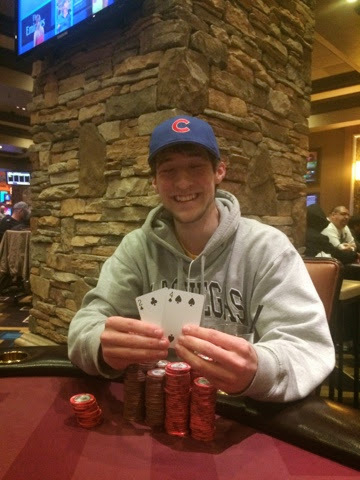 Here are the results from the January 2014 Heartland Poker Tour Main Event at Thunder Valley Resort in Lincoln, CA. Mike Riddle - 6th Place January 2014 HPT Main Event - $26,023. Crippled earlier when his JJ fell to 88 all-in preflop against Rick Colson, Riddle moved all in with 22 and was hesitatingly called by the AQ of Ricky Lay in a 2 million chip pot. There was a Q on the flop, no more 2's came and Riddle, from Elk Grove, CA, is out in 6th for a $26,023 payday. Mark Violetti - 7th Place, January 2014 HPT Main Event - $12,165. Nick Shkolnik moved all in from the small blind when it folded around to him, and he had Violetti covered. Violetti hesitated a moment and then decided he was ahead with A2, so he made the call for his tournament life, and he was right. Shkolnik was holding J5, but there was a J on the flop, no A came, and Violetti, from Red Bluff, CA is out in 7th place. 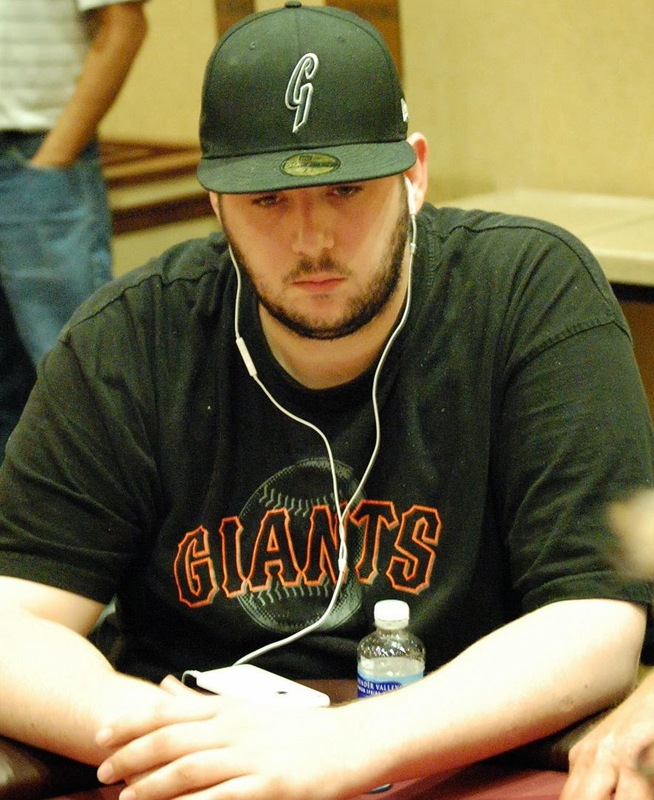 Jared Griener - 9th Place - January 2014 HPT Main Event. He moved all in with AK only to get called by the AK of Nick Shkolnik and they chopped. Three hands later he picked up 66 and ran into the AK of Ricky Lay. The board ran out A7J4T and Griener was eliminated in 9th place. Here are the results from Event 13 of the @HPTPoker series, the $150 hold'em with $50 bounties. Brett Murray has twice been all in and at risk at the 10-handed (un)official final table here. First he doubled through Gina Stagnitto, AK>KQ, then he doubled again with AK, this time against the TT of Tom West when there was an ace in the window. He has moved from a 10-handed starting stack of 550,000 to more than 1.5 million now. Scott Ball - 12th Place - $11,242. Hop Lay raised, Ball shoved for 620,000 and Lay called. Ball had K7 and Lay TT. There was a T on the flop. Mark Violetti and Erik Werner mix it up preflop and get all their chips in the middle on the flop of Q97, with Werner showing AA. Violetti, however, hits middle set with 99, and he doesn't stop there, as the turn is the case 9, giving Violetti quads. Yeah, quads are good enough there, Violetti moves to 1,750,000. Werner drops to about 800,000. Players are going on their next scheduled 15-minute break on the @HPTPoker Main Event, with the hour-long dinner break scheduled for 7pm tonight. 37 Players remain in the event, we are playing down to the Nationally-televised 9-handed Final Table tonight. Here are some of the top stacks in the @HPTPoker Main Event with 44 players remaining. We have just made the first money jump, with players 36-45th place now cashing for $3,262. We are hand-for-hand on the money bubble in the @HPTPoker Main Event, and on the very first hand we get an all-in and a call over at table 4. Paul Dias had moved all in on a flop of 8♥5♠Q♥ and is called by Don Deeds, who has him well-covered. The turn 7x and the river 6♠ means Deeds' hand holds, he has Dias covered, and hand-for-hand lasted one hand. The remaining 54 players are in the money. Here are counts for some of the top stacks with 68 players remaining @HPTPoker Main Event, we are 14 away from the money as we start Level 18. Don't see yourself listed, send a Tweet to @TVPokerRoom with your stack size. Over at Table 3 with blinds at 2000/4000, Joe Nguyen, a former @HPTPoker Fresno Main Event champ has moved all in for around 38,000. Without realizing there is an all-in out there, James Colson announced "12," indicating a bet of 12,000. Once it was pointed out Nguyen was all-in -- and before Colson had put any chips out in front of him -- Colson mucked his cards, causing others at the table to ask the dealer for Colson's 12,000 chips to go into the pot. Floor is called, and Colson argues that even if he was betting 12,000, it is not a legal bet as it is far below the 38,000 Nguyen has out there, so he should not be committed to his chips being moved into the pot. Tournament director Jeremy Smith and Thunder Valley's John Rochfort rule the verbal "12" was a commitment to bet 12,000 chips, and Colson is told to move the chips in, and his cards remain in the muck. Do you agree or disagree? Add your comments below. We lost 29 players in the first 69 minutes of play in Day2 of the @HPTPoker Main Event, with 54 cashing today and first place being just shy of $160,000. Greg @zarrdogg White ran his AK into 99 a while ago, seeing a 9 come to take him for a big part of his stack. Now er gets moved to a new table, and this time he looks down to see he is the one holding 99 this time. He gets his chips in the middle and the big stack of Gina Stagnitto makes the call with 22. Stagnitto turns a set and White's day has come to an end with 106 players remaining. Exequiel Fernando leads out for 7,200 from the cutoff and both blinds come along. The blinds check the 3♣9♠6♠ flop, only to see Fernando make it 12000. Erik Werner makes the call from the SB and the BB quickly mucks. The Q♣ turn comes out and Werner fires out 8 orange 5k chips, 40,000 total and Fernando clearly does not like what he sees. He rechecks his hand, counts out his stack and sees the 40,000 bet is for most of his stack. After a full three minutes, the cards go in the muck. We are halfway through Level 15 and we've only lost 9 players so far today.